Southcoast Health was recently recognized as one of the top 10 healthiest employers in Massachusetts by the Boston Business Journal. 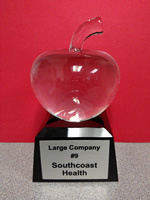 At the Healthiest Employer Award ceremony on March 31, Southcoast Health was named No. 9 in the large employer category (500 or more employees). More than 100 companies vied for the top spots in all categories — small, medium and large businesses — with just 26 receiving honors. Southcoast has placed in the top 10 in three out of the past four years, earning top honors in 2014.